In the past few weeks I had two close encounters with the Environmental services of Lewisham Council. The first took place on Monday 25th January, there I met the highest echelons of the environmental services, namely the Head of Environment at LBL Nigel Tyrell (of Love Lewisham fame), and the Strategic Waste and Policy Manager Sam Kirk. As if that wasn’t enough there was also Steve Brown, who is the Managing Director of both the SELCHP (South East London Combined Heath and Power) and MRF (Materials Recycling Facility), two major operation for waste treatment. I can’t stress this enough, but I am really grateful for their precious time and the opportunity afforded me. The meeting emerged as a follow up to my questions to Council about kitchen waste and its suitability for a power from waste plant (I’m told this is how the place formerly called incinerator should be called from now on) like SELCHP. The meeting lasted for 1 and 1/2 half hour, so besides my proposal for kitchen waste we also discussed many other aspects of waste collection and treatment, mostly, why the SELCHP is not delivering heat besides power and what’s needed to make this happen; what recyclables are collected and all the problems connected with the practicalities of the service; how to educate and involve more people in aiding a more efficient service and emerging policies and various best practices. The discussion also touched on the subject of Council’s core services and the growing opportunities for partnering with an expanding private sector delivering environmental services. In all an open wide discussion and for me a lot of food for thought. Now, before I move on to the next encounter with the environmental services let me touch on my kitchen waste proposal. The idea is good and they really evaluated it, there is unfortunately a physical limit that I didn’t know of that makes it at present impossible, and that’s the capacity of the turbine at SELCHP to produce more electricity that it currently does. The fact is that the turbine is already working at full capacity, and this means that even increasing the caloric content of the combusted you wouldn’t extract any more energy, and therefore no increase in revenue from sale of that energy to then pay for the composting. I asked if an extra turbine could be retrofitted then, and the short answer is that in theory yes, a problem could be the size of the site, that may not be big enough. So, it’s still a decent idea, it’s not applicable now and it may never be applicable to SELCHP in particular, but if we must build more power from waste plants it would be worth considering that they can deliver much more energy than the past generation does by being more selective of the materials combusted, something that could be achieved through means of market by applying different gate fees for different materials as is the case in some countries that have a more advanced policy of waste treatment. Anyway, towards the end of the meeting a proposal came, to join a crew of Bin Men and see for myself what a collection of recyclables is for real. And that’s how it happened that I became a Bin Man for one day. And I loved it! The day, Wednesday 24th February, the place, Wearside Road Depo, I am greeted by Alvaro Espinosa, operation manager, “I had two eggs for breakfast” I tell him “you should have had six” he replies. After receiving my steel capped boots and hi vis vest I receive my bin man induction, I am instructed on the controls of the bin lorry, how to latch the bin and lift it, domestic bin, commercial bin, and all safety procedures which include the recommendation “and when the bin comes down it’s best to stand to the side, they don’t normally fall, only when you’re looking away”. Then off to join the crew in Forest Hill, Tom, Noel and Krzysztof. The level of job satisfaction is surprisingly high, Bin Men are environmentalists, and of the practical kind. The older guys saw our society getting more wasteful through the content of our bins, and they have a lot to say about it, because they do a lot about it. The phrase “getting down and dirty” was never truer, they open every bin and check its content to avoid contaminating the rest of the lorry. Unfortunately people throw all kinds of unsuitable material in the recycling bin. 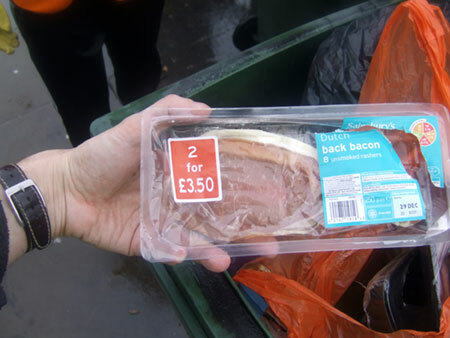 Like this packet of bacon, which is quite obviously neither made of paper, tin, plastic or glass, and together with similar items has the potential to send a lorry of recyclables back to Lewisham to be incinerated. I actually very much enjoyed the job itself, there’s a lot of running and it’s teamwork, it strongly reminded me of basketball. In fact the crew loves the action. I spoke with one manager that made a career from Bin Man up and moved in the office, he still sometimes go out with the crew, for the workout and the excitement. Here are two little action videos, the Lorry Hop and the Bin Man Run, to show the appeal of the action. And here’s Krzysztof doing a reverse in a narrow road clogged by parked cars and road works that Jeremy Clarkson can only dream of. Here we are in the lorry driving down to Nathan Way to “tip” the lorry. Chatting about contaminated loads and rounds of collections, the radio tells details of dog fouling, the other side of the Love Lewisham service. Finally there and I’m told how long we have to wait. It’s an incredible situation but Greenwich lorries have preference and so Lewisham lorries wait up to 2 and half hours, watching the Greenwich guys passing in front of us and that’s exactly how long we had to wait too. This situation occurs because Lewisham has only recently switched to deliver the recycling directly there, it used to tip the lorries in another depo that would then bring the rubbish to Nathan Way overnight on larger trucks but this was too expensive, I’m told that a better contract is being negotiated so that Lewisham lorries don’t have to endure this absurd wait for much longer. Anyway, since we had to wait at this point the Asterix that I had found neatly piled inside a bin in Forest Hill came handy indeed. I think I correctly applied the hierarchy of waste disposal here, reuse, reduce, recycle. 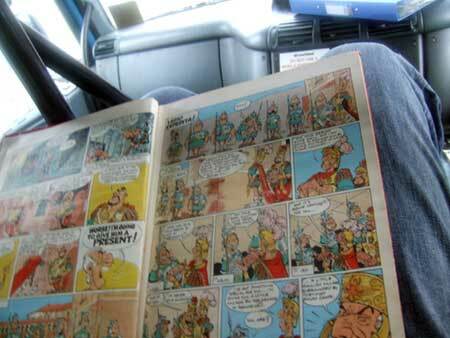 Asterix, re-used, not re-cycled! And here’s what the view from the window was, the monster trucks of the MRF in action among the plastic eating seagulls of Nathan Way. Fascinating, but not for 2 and 1/2 hours. 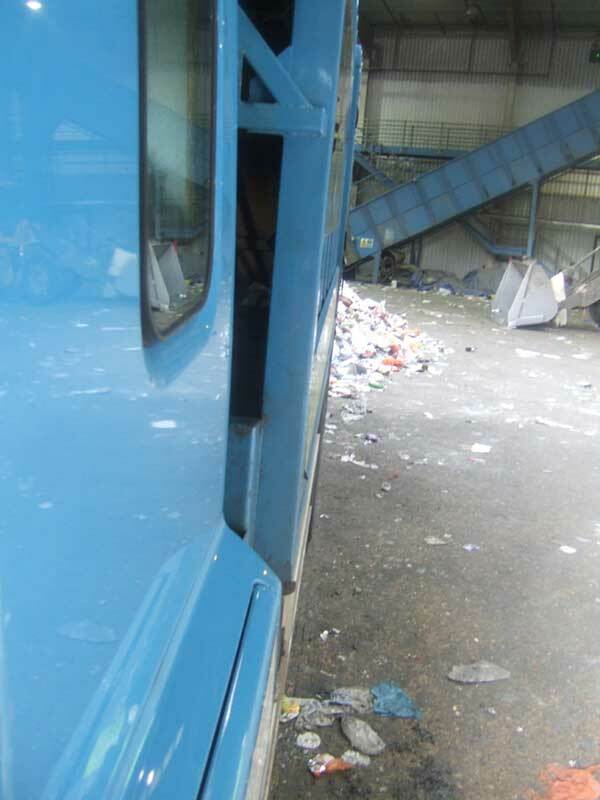 This is instead the view of the rear of our truck after it finally unloaded its 8 tons of collected recyclables on the floor of a warehouse inside the MRF. It will be checked through and if despite all efforts it will be found contaminated it will be sent back to Lewisham. And that happens quite often. But that’s only more reason to think up better ways to educate those few that rather mindlessly spoil entire truckloads of collected recyclables with used nappies, rotten bacon and alike. We also need to widen the range of recycled materials and of course I still think that all compostable material should be composted, not burnt. It’s a great challenge, but there are also great opportunities ahead, like with the mattrasses scheme, where a private operator approached the Council and asked to partner and take care of mattrasses. They found a way to make money out of them and they make the Council services virtually bigger without adding burden to the taxpayer. Waste is a resource and we must improve our recycling. We have in Lewisham an imaginative management and a committed workforce, and yet the recycling rates lag behind many other boroughs. Is it because we rely heavily on the SELCHP and the materials extracted there don’t make good to the statistics? Or is it because we lack sufficient political support to the work of the environmental services? Maybe it’s a bit of all of this, but frankly I find it really bizarre that Lewisham’s Cabinet doesn’t have a dedicated member for Environment. We have a member for Customer Services, which include both Environment and Housing, two huge portfolios held by only one person. On housing, Lewisham is a notoriously poor performer, recently the Council lost £150m for home improvements that had already been allocated to them for failing to achieve adequate rating. As for the Environment indicators, the poor recycling rates recorded do not express adequately the efforts made by the services. All this tells me that this unwillingness to commit sufficient political attention to what happens on the shop floor has been a mistake. Lewisham Council’s Head of Environment wrote an extremely interesting guest post published today on Brockley Central. To use the service, residents can obtain a special sticker from any local Lewisham library or from Lewisham Council’s Access Point in Laurence House, Catford. The sticker is then placed on the mattress. The mattress will be collected on the same day as scheduled refuse and recycling collections. Residents just need to make sure the mattress, preferably with sticker attached, is placed near their refuse bin the evening before collection day. Thanks Nigel. Great initiative for the mattresses. And of course kudos for the openness. Nigel, you are probably aware that I’ve investigated issues around recycling of kitchen waste (what the Daily Mail elegantly calls the slop bag). According to answers I received from Council (thanks) it appears that kitchen waste amounts to about 30% of collected household waste, it costs £1.2m in gate fees at SELCHP and being largely made out of water it hampers the efficiency of the SELCHP with a loss of potential earning from the sale of energy produced on site of about £2.5m. I had suggested that those money could be used to pay for a composting service, generating a good number of local jobs too but at last Council was told that there are contractual and legal barriers that prevent a switch from incineration to composting but no detail of what these barriers are was given. Can you please explain what these barriers are and what proposals are you considering to deal with kitchen waste in the future? In the past hour me and Nigel got in touch and this meeting is now being arranged. If you want to know more about my proposal just see the posts tagged SELCHP. The Love Lewisham blog is managed by Nigel Tyrell, Head of Environment for the London Borough of Lewisham. It is mainly an area for updating friends of Lewisham’s Environmental services (but I might stray away from the ‘day job’ every now and then!). I hope you find it useful. Please note that the views expressed on this site do not necessarily represent the views of the London Borough of Lewisham. Unfortunately, the investment in recycling services is not sufficient to roll out a borough wide garden waste service. The Council is also keen to assist people through this recession and a further way in which this can be done is through the Love Food Hate Waste campaign. The WCA showed that the dominant category in the residual waste was organic catering amounting to 29.8%, or 3.54kg per household of food waste being thrown into the refuse bin each week. For Lewisham, this equates to 405 tonnes a week costing the Council nearly £20,000 for disposal. In annual terms this is 21,060 tonnes costing over £1m. On average the food that is wasted accounts for approximately £420 per household per year / 0.8 tonnes CO2 equivalent per household – £610 for households with children. In addition there is the environmental cost in terms of food production, transportation, refrigeration and disposal, all contributing to green house gases. And so it is, they think this costs £1m when instead it costs £4m. In the last sentence the argument of the cost of disposal is touched but only as a general consideration about the green house gases produced. This is a spectacular example of disjointed thinking, they own an incinerator that produces energy by combustion and by bringing there their kitchen waste they feed it with lots of water. Which of course doesn’t burn that well. They waste millions each year and apparently they don’t even know about it. And even going at Council to try to explain to the Mayor that the Council is missing on a major trick, as I did last week, doesn’t seems to work much. A consideration about the figures. This document evaluates Lewisham’s kitchen waste as 29.8% of the total and 21,060 tonnes in weight, this clarifies how much is kitchen and how much is garden waste of that 35% of the total of the waste of Lewisam that is compostable. It looks nevertheless quite likely that this figure doesn’t include commercial waste so the total figure could be higher. Anyway, even with 20% deduced from the £3.1m that I had calculated as loss of earnings at the incinerator we would still remain with £2.5m, with still about £1.2m of savings in gate fees at the incinerator to be added to it, that’s £3.7m that could indeed pay for a decent collection and composting service. Another thing to be considered is that compost has a value, once all those thousands of tons of waste are converted you’re left with something that can be sold. And as previously mentioned bin lorries traveling a third lighter represent a further saving. 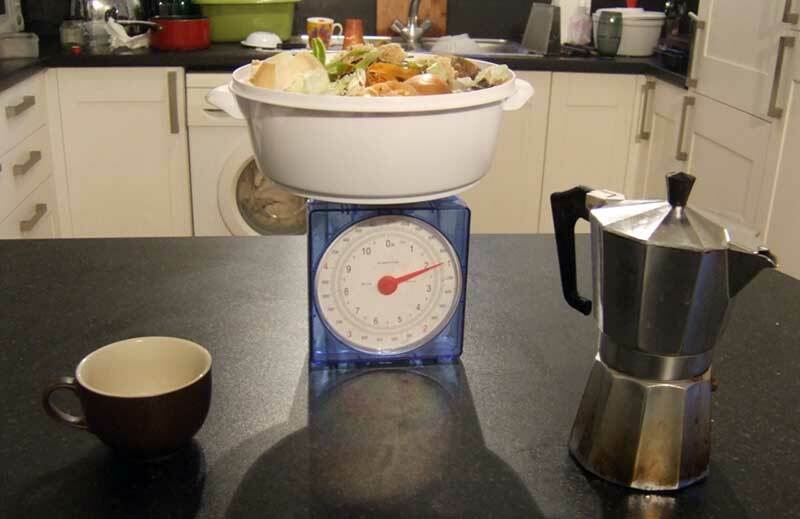 That’s my kitchen, my Italian coffee machine, a coffee cup, a small scale and on top of the scale a bowl of kitchen waste. Peels, some leftovers of pasta, some stale popcorns, half a lemon that’s gone mouldy, the usual. That bowl holds a day of compostable kitchen waste and according to my calculations that’s about 15p of tax money quite literally burnt if it would be sent to the incinerator. Other Countries have laws that force incinerators to charge different gate fees for different materials, this to discourage incineration of unsuitable materials like… kitchen waste. In Britain we don’t have a law to that effect, SELCHP charges a flat fee, no matter what you bring to it. Another beat that the current Council’s policy misses is the collection of oil, as Cllr Milton reminded us you can bring your used oil to the recycling centre in Landmann Way, and you should, because it is illegal to pour it down the drain, but don’t do it all together because in making an effort to avoid clogging the drains you’ll clog the transport arteries of the borough. Seriously, who’s going to Landmann Way to bring their used oil? If a separate collection of compostables was set up maybe adding used oil to the list of materials collected would provide a further source of income for those green jobs. There are money there, but I don’t know why used oils from households are not collected, and to be fair to Lewisham Council it’s not just here, this is true for pretty much anywhere, I searched but I couldn’t find any example of a local authority collecting used oil from households. Maybe it’s not done just because there isn’t a regular door to door collection of compostables or recyclables, like what I’m envisaging could be done with the savings on the incineration of kitchen waste. Just one litre (that’s about a third of what’s found in the average chip pan) of used cooking oil can be converted into LF100 to produce enough clean electricity to make 240 cups of tea. And finally, let me close this megapost with a straightforward personal position on incinerators, because I recognize that this proposal of mine can be seen as controversial by many. Incinerators are one of those things that many people oppose with vigour, and with arguments that I agree with. They are ugly, they pollute and they must be phased out. They are yesterday’s news and we should all produce a lot less rubbish than we do and pretty much everything should be recycled in a way or the other, not burnt. But the fact is that we do have an incinerator in Lewisham and it processes tens of thousands of tonnes of waste a year, the unrecyclable, non-reusable and uncompostable byproducts of the lives of those millions that live around it, it currently performs a useful function and we better make the most out of it until we find a better way to deal with waste. But that will take many years, and as the incinerator in Lewisham holds the key to the waste management budget I don’t think that there’s a conflict between environmentally sound policies and a proposal about the incinerator that is not just “let’s shut it down” but that instead looks at ways to shift some of that budget into local green jobs. Please provide a breakdown of the energy produced by the SELCHP divided into energy produced by incineration of kitchen waste and that of other kinds of waste. What share of this energy production belongs to Lewisham Council and what share of this energy is produced by the incineration of waste produced by Lewisham? The total energy output of SELCP is 220,000 MWh per annum. From SELCHP’s waste analysis approximately 6.9% of the energy comes from putrescible kitchen waste. Therefore energy recovered from Lewisham kitchen waste is about 3,600 MWh per year (after deduction of a contribution to the total parasitic load of running the plant) or 1.6% of the total energy output. This isn’t the first post on this blog about this or the fist time I question the Council on the matter of the incinerator, the revenue it provides and the appropriateness of what’s fed to it, read more here and here. We know that kitchen waste forms about 35% of the incinerated, and now we also know that it only produces 6.9% of the energy (the 35% is the figure we have for both kitchen and garden waste combined, but I think that we can safely assume that the weight of the kitchen waste in this mix represents the overwhelming majority with the garden waste being in comparison almost negligible. So, let’s live with this small approximation in the know that we’re only looking for a ballpark figure here). Using the figure provided by DirectGov of 14.0p/kWh as the price for bulk purchase of electricity at domestic or small industrial scale in July 2009 we can put a MWh (unit of the answer) at £140 and this means that 52,360 MWh is therefore sold at approximatively £7,330,400. Of this amount the kitchen waste, that is about 35% of the incinerated, produces only 6.9% of energy – 3,612 MWh (the answer says 3600 after deduction of a contribution to the total parasitic load of running the plant, the difference with this calculation is so marginal that I’m not even going to approximate all calculations for that) – at £140/MWh this bring in £505,797. The remaining 65% produces instead 93% of the energy – 48,695 MWh – at £140/MWh this bring in £6,817,300. – £104k if non kitchen waste. For each percentage point of kitchen waste swapped for non-kitchen waste Lewisham Council would make over £90k, and given that there is enormous demand for the use of the incinerator it would be possible to take out the kitchen waste from the mix and allow non-kitchen waste from other boroughs or other clients to be incinerated instead, this would produce an extra profit for Lewisham Council of well over £3m through increased energy production. The reduction of 35% of Lewisham’s incinerated waste would also bring a saving in gate fee at the SELCHP of £1,211,268 for Lewisham (see here). This would be revenue-neutral for the SELCHP (of which LBL is a partner) as the fee would be replaced that for waste from other clients. It looks to me that there is therefore an untapped budget for composting of well over £4m available year on year to be derived from the removal of kitchen and garden waste from the incinerator (without even counting the savings of fuel for the fleet of bin lorries that would always travel with a load about one third lighter than they currently do). These savings could be able to fund a labour intensive composting operation that would provide a large number of local jobs to collect and compost kitchen and garden waste in microsites around the Borough. For quite some time I wondered if those savings would be able to pay for a replacement collection and composting service, I’d now say that yes, they probably do. The figures need reviewing and I welcome opinions on this proposal. Yesterday I used my opportunity for a supplementary question to try to explain this to the Mayor, I tried my best to be clear but it’s not an easy thing to do in a Council meeting. I had with me a sheet of paper with these calculations and wanted to give it to him, I explained him “look, I found over £4m for composting in your budget”, but he wasn’t having it, no one came to take the paper to bring it to him, so I sat down and I now write it here.